In this Carnegie essay by Anthony Bryk, Louis Gomez, and Alicia Grunow, the authors argue that the social organization of the research enterprise is badly broken and a very different alternative is needed. 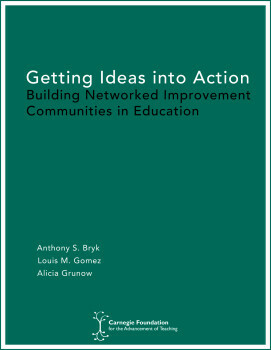 They instead support a science of improvement research and introduce the idea of a networked improvement community that creates the purposeful collective action needed to solve complex educational problems. The essay builds off an earlier essay by Bryk and Gomez, “Ruminations on Reinventing an R&D Capacity for Educational Improvement,” prepared for a 2007 American Enterprise Institute Conference.